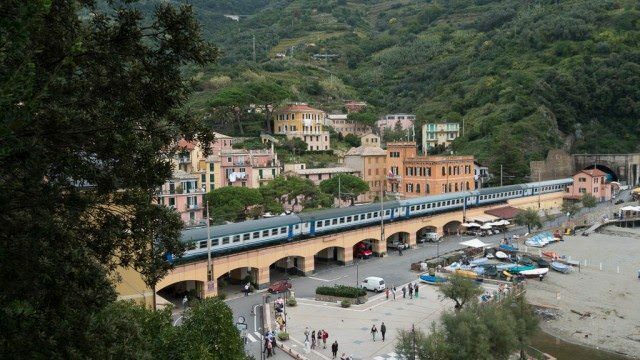 You are here: Home / Destinations / Europe / Italy / Cinque Terre / Six Shore Excursions From Livorno: Which Is Best? 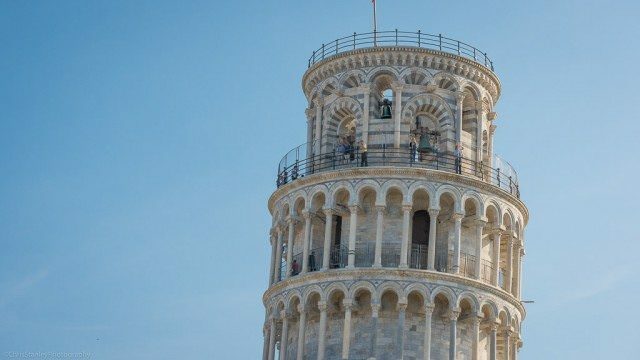 Florence, Pisa, Lucca, Cinque Terre, Chianti, Siena & San Gimignano? Draped in vineyards, Tuscany’s cypress-studded landscapes stand ready to welcome cruise passengers calling on Livorno. © 2014 Avid Travel Media Inc.
Livorno is the gateway port to cypress-studded landscapes, rolling hills draped in vineyards and cities crowned by some of the world’s greatest masterpieces. Typically, however, cruise ships dock for only one day in Livorno, limiting the options available to cruise passengers. With a half dozen or more shore excursions from which to choose, the cruise passenger visiting Livorno will need to choose a single shore excursion — often at the expense of other experiences that could have been equally as enriching. 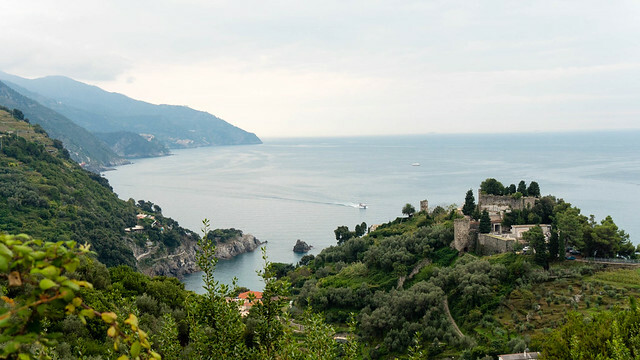 Many cruise passengers choose to visit Florence, for example, passing up Cinque Terre, where five picturesque villages cling to seaside cliffs. 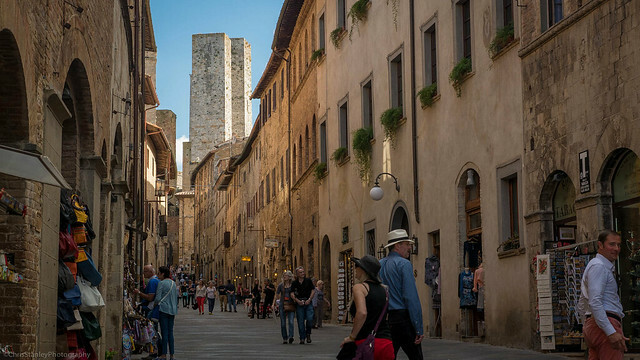 Others forego charming medieval towns such as Lucca, Siena or San Gimignano. 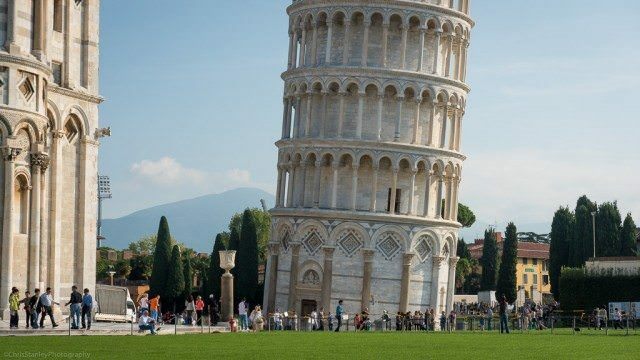 Some skip the castles in Chianti; and others miss Pisa, with its leaning tower and UNESCO World Heritage monuments. You can’t do it all, but you can pack in as much as possible. To do so, you should prepare to hit the ground running. 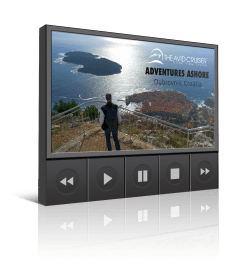 Which shore excursion should you choose? While that’s a personal decision based on your interests and aspirations, you may find some help here. Recently I spent a week in the Tuscany region to explore the breadth of shore excursions available to cruise passengers. 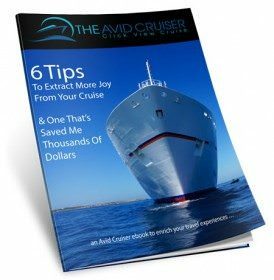 My ambition with this post is to provide you with information that you may find useful in helping you to make informed decisions about how you’ll spend your day when your ship docks in Livorno. Following is my take on six shore excursions from Livorno. Florence is phenomenal. 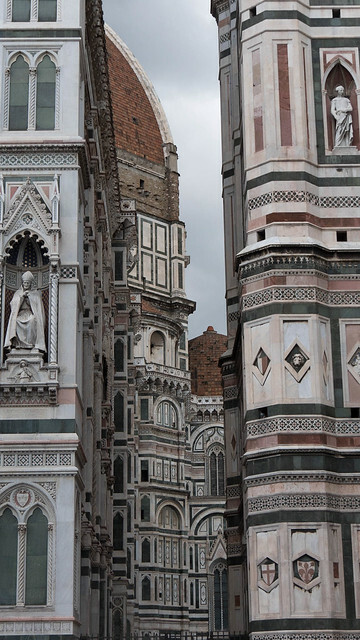 Few, if any, European cities can be compared to Florence. Paris has its Eiffel Tower, Venice has its canals, Rome has its Coliseum. 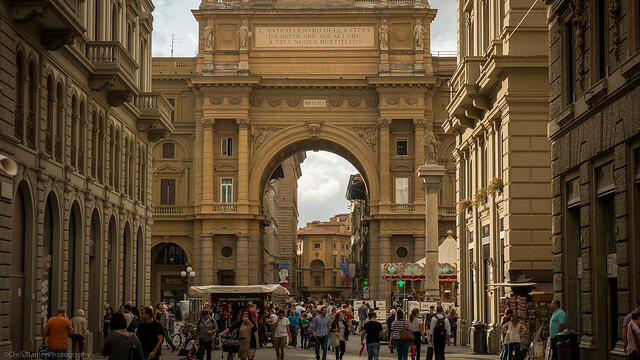 What Florence has is the beauty of Tuscany framing a city crowned by masterpieces. Florence as seen at sunset from Piazzale Michelangelo. 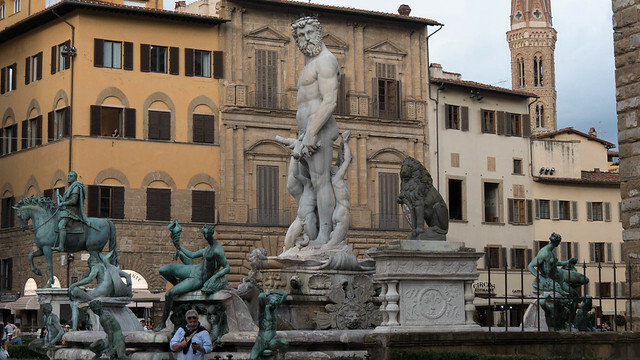 © 2014 Avid Travel Media Inc.
You could allow yourself to get lost in Florence and have a perfectly memorable day. I don’t advise that, however. It’s a good idea to have a plan of what you want to experience so that get the most from your visit. First, though, you need to get yourself to Florence. From Livorno, that takes as long as 90 minutes along highways that offer picturesque glimpses of the Tuscan countryside. Florence’s iconic Ponte (bridge) Vecchio spanning the Arno River. 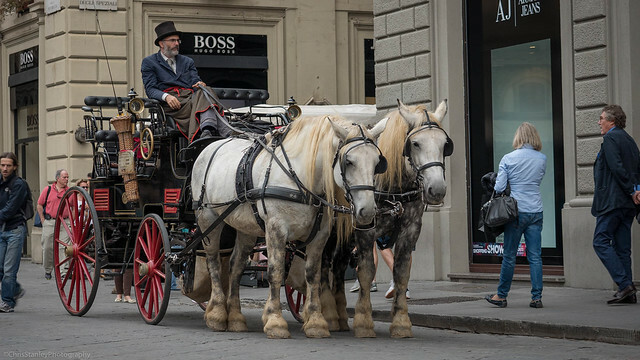 © 2014 Avid Travel Media Inc.
Once you’re in Florence, make your way to the Old Town, where you’ll take a stroll through this UNESCO World Heritage Site. Be sure to bring comfortable shoes. 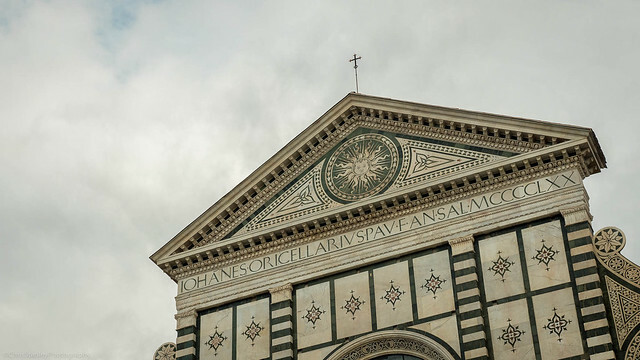 To see Florence properly involves at least two miles of extensive walking, and some of it on cobblestone streets. You may want to visit the Galleria dell’Accademia, a museum where you will want to step inside to admire Michelangelo’s statue of David, representing the Biblical hero David. 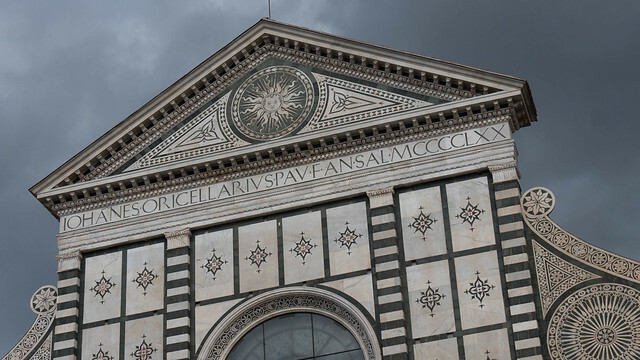 A masterpiece of the Renaissance, the sculpture ranks as one of the world’s most revered art pieces and is a must-see for any visitor to Florence, that is, unless the lines to get into the Accademia are too long. 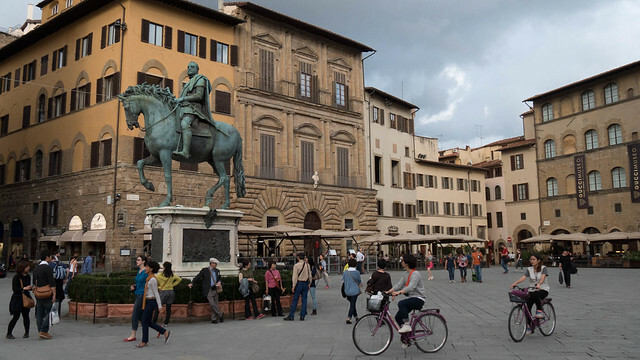 If that’s the case, you can find a replica of the statue in Piazza della Signoria (Signoria Square). 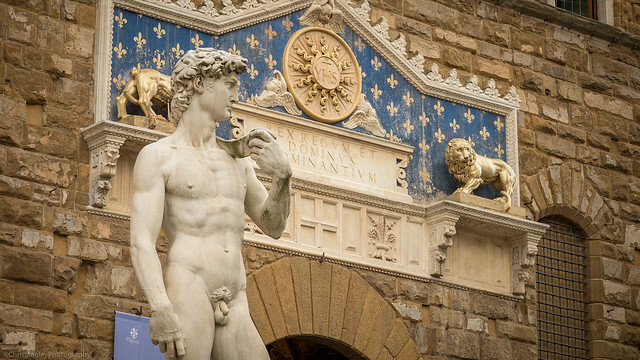 In fact, when the original David was unveiled in 1504, it was placed outside at Signoria Square. It wasn’t until 1873 that the statue was moved inside the museum. A replica of Michelangelo’s David at SignoriaSquare. © 2014 Avid Travel Media Inc.
As you stroll Florence, you’ll certainly be tempted by gelato, which you’ll have no trouble finding — but much trouble resisting. You’ll certainly see whipped miniature mountains of the Italian-style ice cream coaxing you into a plethora of shops that you’ll pass on your walk through Florence. The presentations and the flavors will have you salivating within seconds — at least that’s the way it works for me. While nearly all gelato is good gelato and nearly any shop can serve a scoop that will make you squeal in delight, there are some shops that serve exceptional gelato. 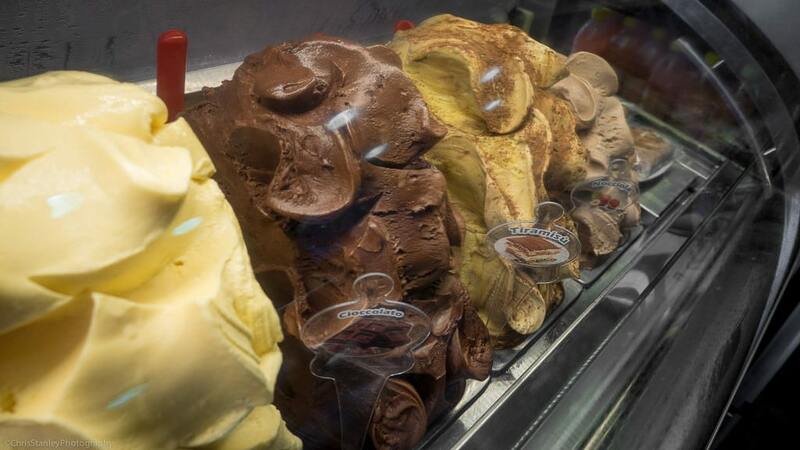 For a listing, see Top 10 Gelato Shops in Florence. In Florence, you will find mountains of gelato to tempt the tastebuds. © 2014 Avid Travel Media Inc.
You would be hard-pressed to miss the Florence Cathedral, with its stunning pink, green and white marble facade. 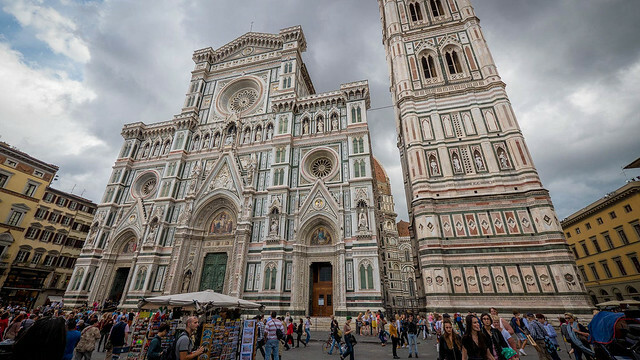 Spend a few minutes outside to frame the perfect photograph, then head inside to admire the cathedral that is known poetically as the Basilica di Santa Maria del Fiore, or the Basilica of Saint Mary of the Flower. Sounds beautiful, and it certainly is. 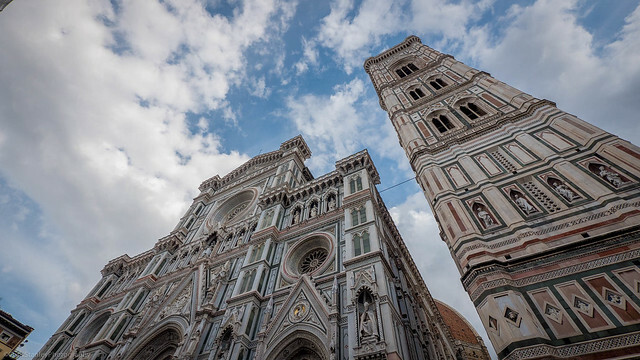 Florence Cathedral, or officially, the Basilica di Santa Maria del Fiore (Basilica of Saint Mary of the Flower). 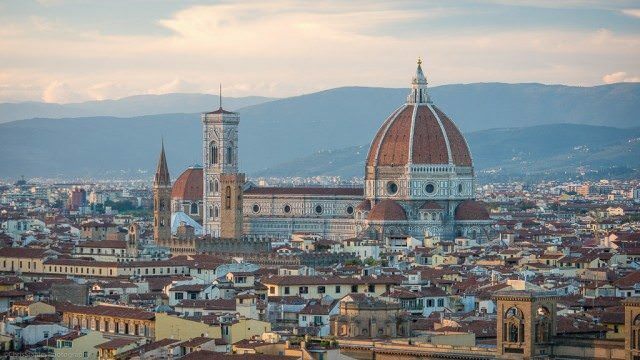 © 2014 Avid Travel Media Inc.
Building started on the site of the Florence Cathedral in 1246, but the structure wasn’t completed until 1496, when it was crowned by its magnificent dome. The finishing touch was a remarkable feat. 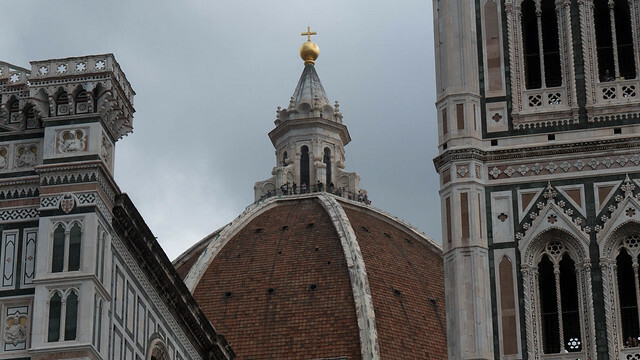 Italian architect Filippo Brunelleschi designed the dome and raised it without the use of temporary supports. I’m not sure how he did it, but to better appreciate the dome I climbed the nearly 500 steps to the top, where I walked outside and around the dome. 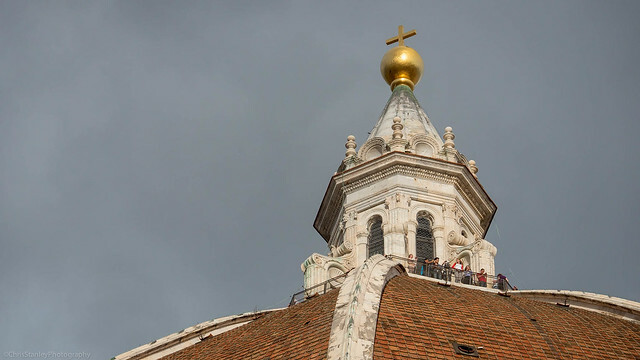 Alternatively, you could go up the adjacent bell tower to admire the dome from another perspective. 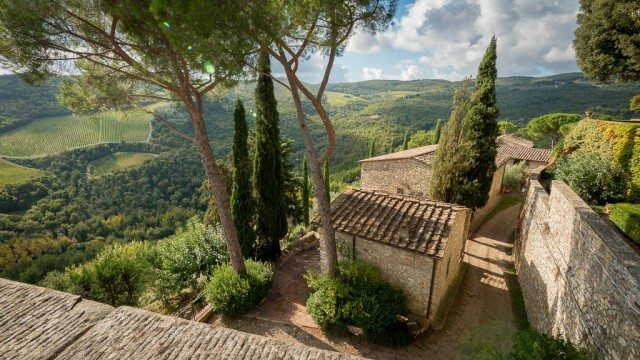 Either way, you’ll be rewarded with commanding views of Florence and snapshots stunning enough that you’ll immediately want to change your Facebook profile photo. View from the Dome at Florence Cathedral. © 2014 Avid Travel Media Inc. If you skipped the gelato and have a hankering for something substantial and delicious, try Bistecca alla Fiorentina (Beefsteak Florentine style). It’s a T-bone that is traditionally sourced from select breeds of cattle and grilled over a wood or charcoal fire. The steak is seasoned with salt, sometimes with black pepper, and olive oil, applied immediately after the meat is removed from the heat source. I enjoyed a memorable thick cut of this Tuscan favorite, reasonably priced, at La Spada. In olden days, you would have found the makings for Bistecca alla Fiorentina at the famous Ponte Vecchio, the iconic Medieval stone-closed bridge crossing the Arno River. Butchers were the original occupants of the shops lining both sides of the bridge. Today souvenir shops and jewelers occupy this prime stretch of real estate crossing the river between the neighborhoods of Ponte Santa Trinita and Ponte alle Grazie. 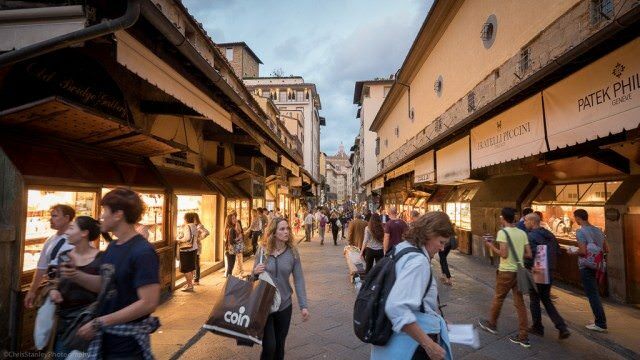 Shops, primarily selling souvenirs and jewelry, line Ponte Vecchio. © 2014 Avid Travel Media Inc. 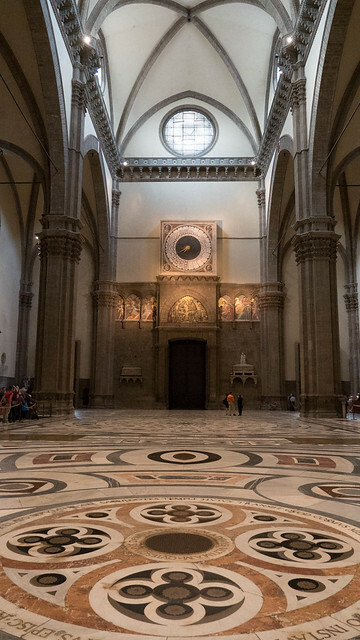 There is so much more that you could do and experience in Florence, including a visit to Piazza Santa Croce and the beautiful Basilica of Santa Croce. A day in Florence simply isn’t enough to see it all, but at least you have sampled a taste of this fine city. You can always return for a longer stay at some other time. I know I intend to. View from Castello Vicchiomaggio in the Chianti region. © 2014 Avid Travel Media Inc. If there’s one place that may make you think about passing up Florence, it is the Chianti region. 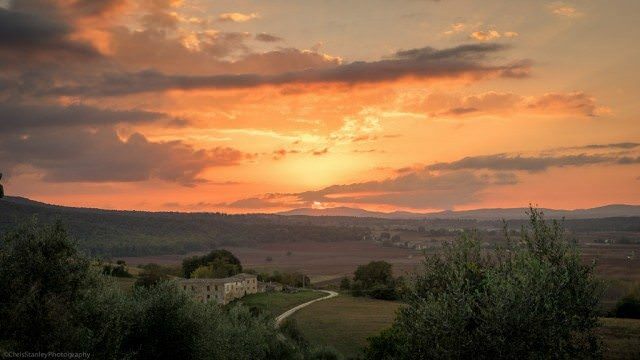 The rolling hills, adorned by leafy vineyards and stately cypresses, are breath-taking to admire — as are the stone castles that watch over many of the vineyards. 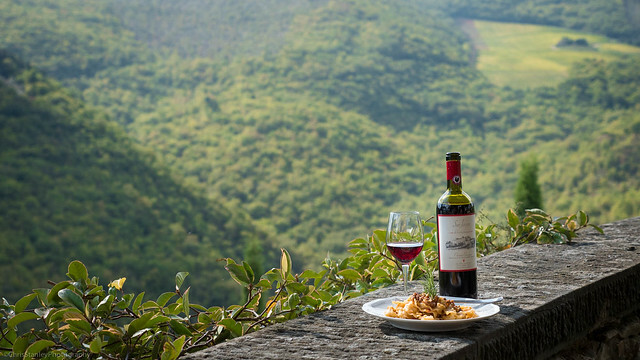 You don’t need to love wine to appreciate the beautiful countryside in this renowned wine-producing region in central Tuscany. If you do enjoy wine, however, you’re in luck. 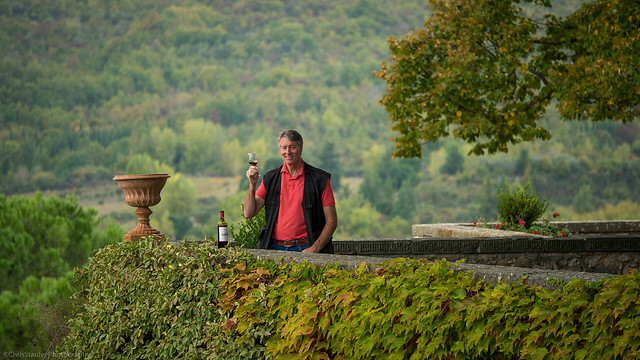 A member of the latter group, I made my way to Castle Vicchiomaggio, where I enjoyed tasting the vineyard’s select Chianti Classicos, which were exceptionally quaffable and perhaps even more tasty than they might have been elsewhere because of the setting. Enjoying a glass of Chianti Classico at Castello Vicchiomaggio. © 2014 Avid Travel Media Inc.
As with Florence, you’ll travel about 90 minutes from Livorno to reach Castello Vicchiomaggio and the town of Greve, the unofficial capital of the Chianti region. With its unusual triangular main piazza, the town is worthy of a quick visit. Stroll the local market, which has been running more-or-less continuously for centuries. Situated in the piazza, the market serves Castello Vicchiomaggio, and the nearby communities and hamlets. You probably have not heard of the “Five Lands,” but you may know them by another name, Cinque Terre, a cluster of five tiny and extremely picturesque villages clinging to a rugged coastline. The Cinque Terre is gorgeous, even on an overcast day. © 2014 Avid Travel Media Inc. The Cinque Terre National Park is made up of Monterosso al Mare, Vernazza, Corniglia, Manarola and Riomaggiore. To see all five villages at a leisurely pace would require a week, but you can get a taste of Cinque Terre on a daylong shore excursion from Livorno. Monterosso, one of the five villages that make up Cinque Terre. © 2014 Avid Travel Media Inc.
Travel by motorcoach to Manarola, a charming fishing village with a typical fishermen’s wharf. After a short tour of the village, board a boat to reach Vernazza, another picturesque fishing village — though different from Mararola. Next stop, Monterosso, which some say is the prettiest village of the Cinque Terre. With hues dabbed from a palette of bubblegum pinks, mustard yellows and Chianti reds, the homes and buildings along the Cinque Terre are as much an attraction as the natural spectacle that has earned this stretch of coast its designation as a UNESCO World Heritage Site. 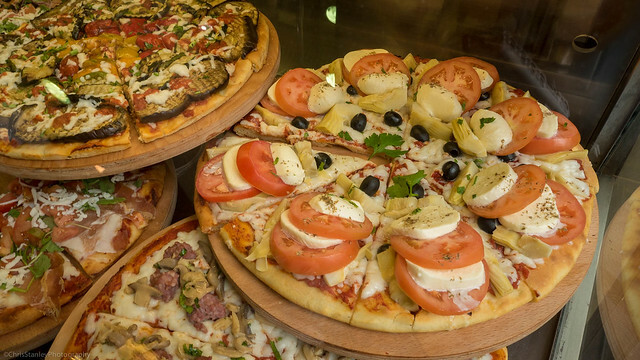 Be sure to sample some of the Cinque Terre products, particularly the local farinata, a thin, unleavened pancake or crepe made from chickpea flour (in Nice, France, it is known as Socca and La Cade in Toulon). The medieval villages of Siena and San Gimignano are good options for shore exursions, particularly for those who have seen Florence. Siena’s medieval skyline. © 2014 Avid Travel Media Inc. Centuries ago Siena was an extremely wealthy city-state. Between 1260 and 1348, well-heeled citizens contributed to a major civic development program, the results of which are evident in Siena. You need do no more than stroll Siena’s winding streets to absorb its enchanting — and still intact — medieval atmosphere. Palazzo Salimbeni in Siena. © 2014 Avid Travel Media Inc.
An 18-month siege imposed by the neighboring Florentines froze Siena in time (that, and a rather nasty bout of Bubonic Plague). 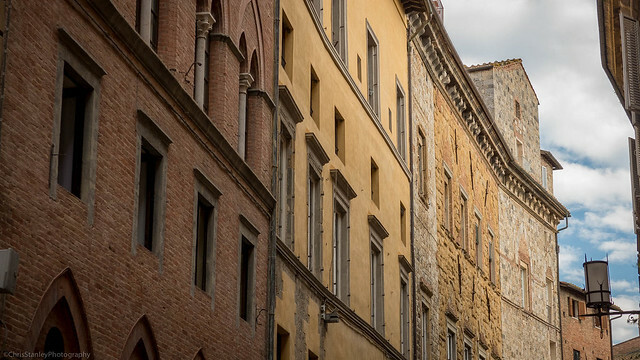 Today most of Siena’s medieval buildings have been carefully renovated and restored. In fact, the entire historic center is designated as a UNESCO World Heritage Site. 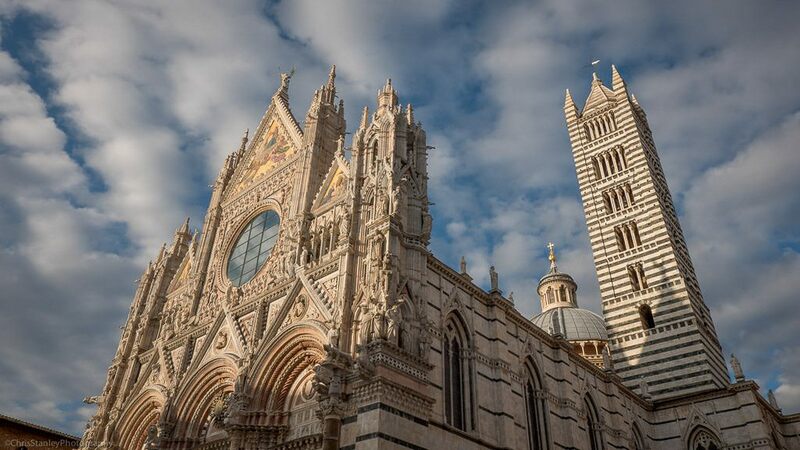 Siena’s Cathedral of Saint Mary of the Assumption. © 2014 Avid Travel Media Inc.
You’ll want to visit the Church of San Domenico, which contains the relics of the famous Saint Catherine, notably, her preserved head. Also make your way to Piazza del Duomo, with its magnificent Cathedral of Saint Mary of the Assumption, built on Siena’s highest hill in black and white marble. 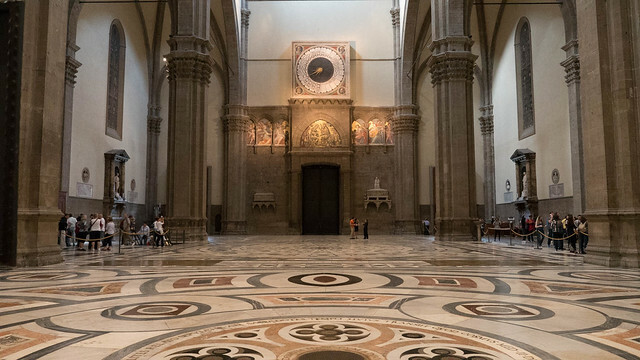 Step inside the cathedral to see the beautiful inlaid marble floor and pulpit by Nicola Pisano. Snap a few photos at the shell-shaped Piazza del Campo, flanked by original 13th-century palaces that symbolized the Golden Age of the city. 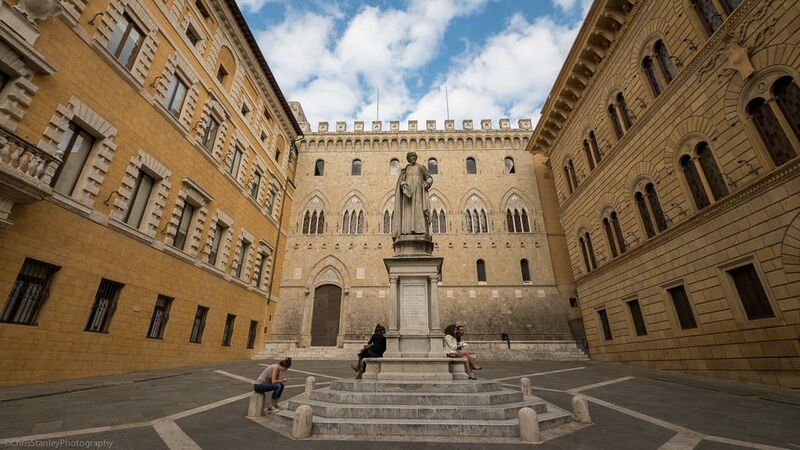 The Palazzo Pubblico, situated in the square, has been the seat of Siena government since the 13th century. 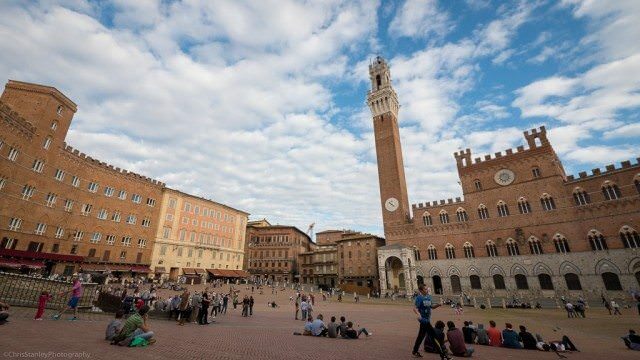 Piazza del Campo in Siena, where the Palio di Siena horse races take place. © 2014 Avid Travel Media Inc. 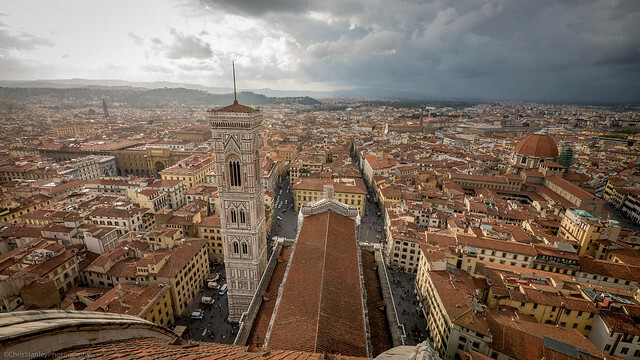 I didn’t have time to climb the Torre del Mangia bell tower’s 505 steps, but I heard from others who did that the effort rewarded them with beautiful views across Tuscany. 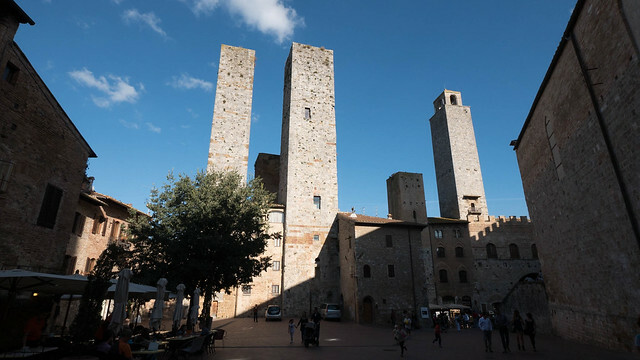 Known as the Town of Fine Towers, San Gimignano is a UNESCO World Heritage Site noted for the preservation of about a dozen of its tower houses. © 2014 Avid Travel Media Inc.
About 30 minutes away from Siena, the town of San Gimignano appears as a hilltop city of skyscrapers. The skyscrapers, in fact, are medieval towers, more than a dozen of them, remarkably preserved. Like Siena, San Gimignano’s historic center is designated as a UNESCO World Heritage Site. San Gimignano is such a picturesque town that director and producer Franco Zeffirelli chose it as the setting for his masterpiece Tea with Mussolini. 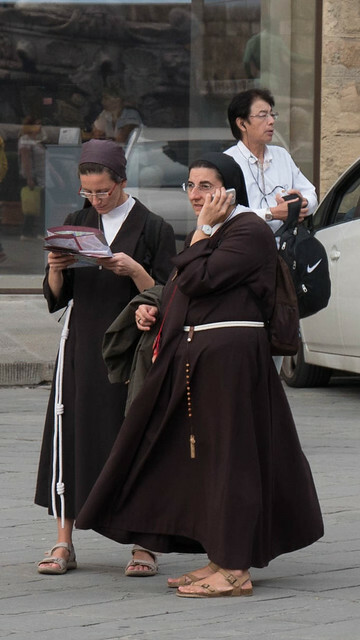 At Piazza della Cisterna in San Gimignano. © 2014 Avid Travel Media Inc. 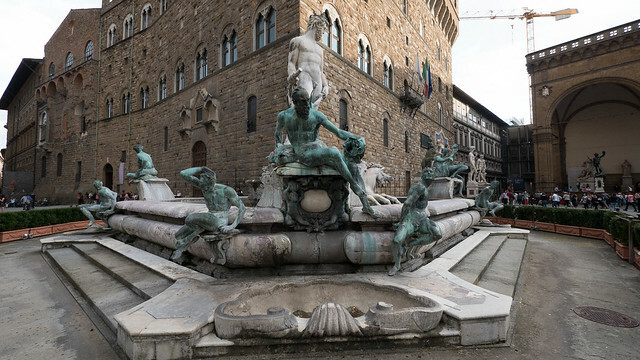 In addition to the towers, check out the Piazza della Cisterna, with its lovely well at the center; the Old Podest Palace, the 1353 Florentine fortress, and the simple Sant’ Agostino Church. The latter hides a heavily decorated Rococo interior by Vanvitelli — architect to the Kings of Naples. Built between 1504 and 1645, Lucca’s ancient walls are among the best-preserved defensive structures of Renaissance Europe. Today, the massive red brick walls double as a pedestrian walkway and bicycling roadway. You could literally walk around — or cycle around — the walls and see the entire town. But be sure to head down into Lucca for the full treatment. Shops and cafes are enclosed within the walls. Walk Lucca’s narrow streets past medieval houses to the Cathedral of San Martino with its richly adorned Romanesque façade. Stroll along the Via Fililungo, little Lucca’s version of the Via Veneto in Rome. 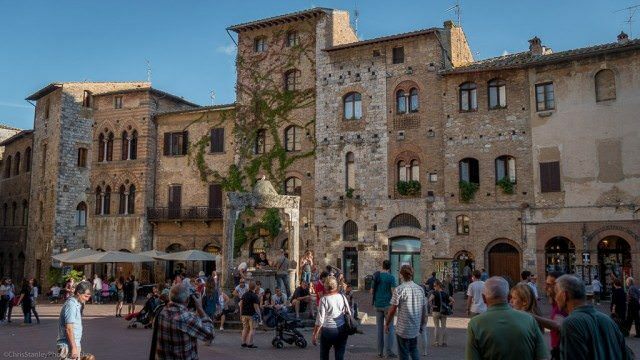 Visit Piazza Mercato, which occupies the site of the ancient Roman theater, and is surrounded by fascinating medieval houses built against the wall of the amphitheatre. Its shape is unmistakable. A visit to Lucca typically can be combined with visits to other sites in Tuscany, including Pisa. Sure, it is a little touristy, but strike a pose at Pisa, pretending that you are holding up the leaning tower. I see hundreds of tourists posing each time I visit Pisa. 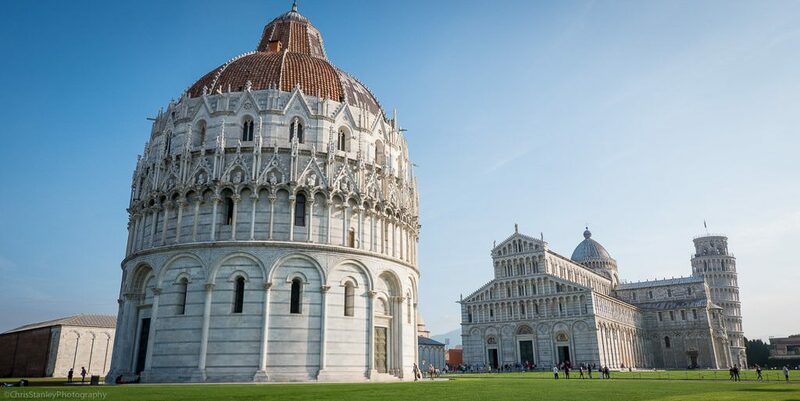 The setting can make a pretty picture, as Pisa is but one of the monuments at Piazza dei Miracoli, yet another UNESCO World Heritage Site. 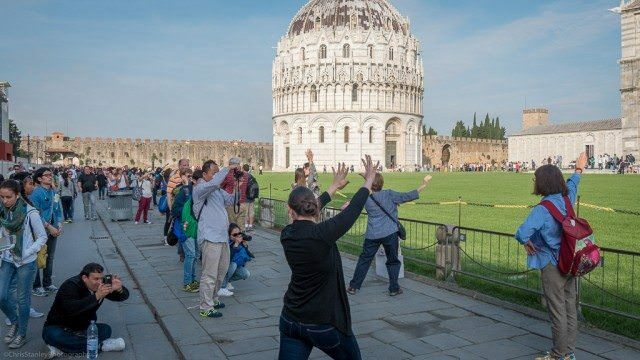 Posing at Pisa. © 2014 Avid Travel Media Inc. 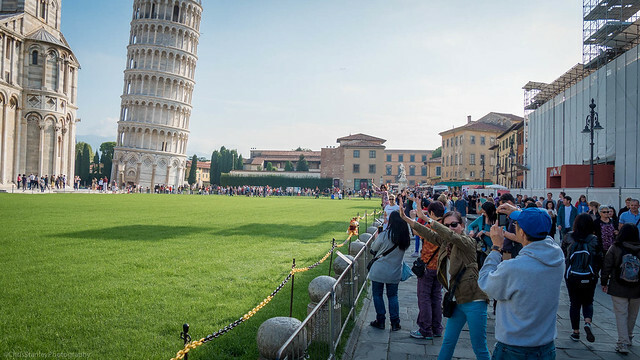 The Leaning Tower of Pisa. © 2014 Avid Travel Media Inc.
On top of the Leaning Tower of Pisa. © 2014 Avid Travel Media Inc.
Monuments at Piazza dei Miracoli, a UNESCO World Heritage Site at Pisa. © 2014 Avid Travel Media Inc.
Ending our visit under Tuscany’s golden sun. 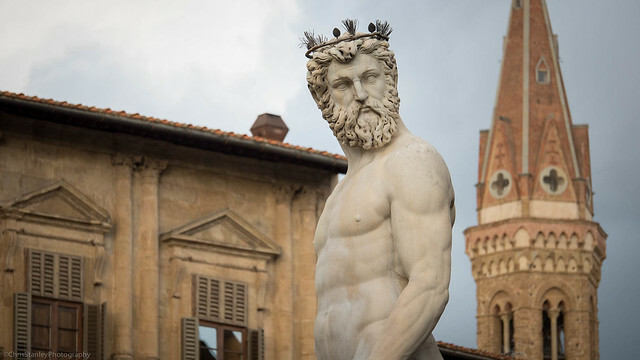 © 2014 Avid Travel Media Inc.
Offering beautiful landscapes, UNESCO World Heritage sites, storied cities and vibrant villages, Livorno serves up a lot to see and experience under the golden glow of the Tuscan sun. Plan your day here accordingly and extract as much for your experience as possible. Trouble viewing the slideshow? View on Flickr.